It is part of my personal philosophy that this is the way outwear should be purchased. And, Old Navy does this every year. I suggest you run to Old Navy and take advantage of it before all the good ones are gone! What are your favorites? Are you going to take advantage of the sale? Leave a comment! I ordered 3, 5, and 6... still pondering 1. You can also combine the 30% off cardholders stuff/save with it which brings everything to really cheap! I've tried on 3 and 5 IRL and both are very nice and fit TTS. 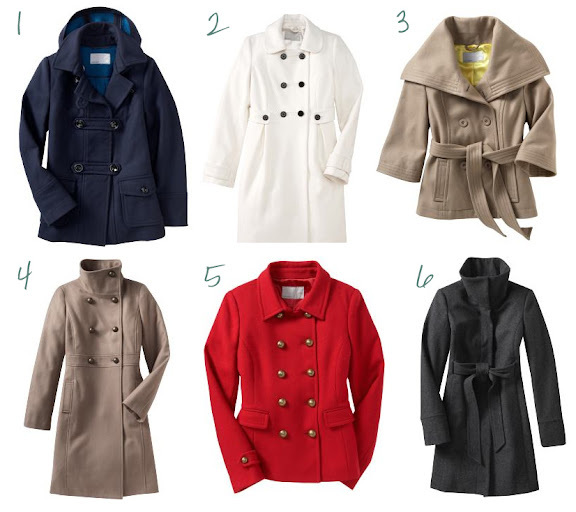 I'm in LOVE with #2- I even tried it on recently while out at an Old Navy and didn't get it because I already have a winter white coat. But I love those buttons and the tabs at the waist- it's just SO flattering! arrgh! I want it! oh my goodness, timing is amazing. i was just going to click over to ON to see if they had any trench like coats---YAY ME! I already did. Last night I ordered the lovely #6- funnel neck coat in grey! What a steal at $44.75 (Even with shipping!). i'll take one through 6 please! wow incredible sale! Thanks for the heads up!!! I almost wish I hadn't seen this post...already ordered #6, along with a bunch of other stuff! PLUS - an extra 30% off if you use your Gap/Old Navy credit card! When I went, they only had a couple in my size, but I got away with the number six in pink...very bold for me, but it looks great with my coloring. I also got a coat for my son and husband. Thanks for the post!